Scripture Reference: Deuteronomy 5:6-21, Proverbs 3:1-2, ". . ..
Concepts: Rules are important; they keep us safe. God's rules are important; they show us how to live a good and long life. But more importantly, they show us our great need for our Savior, the Lord Jesus Christ. 1. Rules of the Road - Hold up pictures of traffic signs and see if the children can identify them. Discuss how important it is to follow rules of the road and the consequences. 2. Set up roads on the floor with masking tape. Bring in small cars and trucks for the children to play with. 3. Put up road signs at intersections. Demonstrate how the traffic signs are used. Players are reminded of how Moses was instructed by God to climb up Mount Sinai to receive the Ten Commandments. Accompanied with a lesson and a craft. 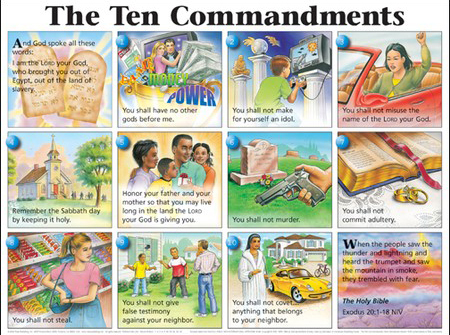 Ten Commandments Race Players race to fill in the correct answers on the tablets. A great memory builder! The copy of the Ten Commandments is our Covenant with God. This is found is Exodus 20, as explained from the above verse. The Confession, "JESUS IS LORD" If the confession "Jesus is Lord" bore such full and weighty content within the context of primitive Christianity, then the question next arises, what was the practical significance of this confession for the life of the church? What place did it occupy in the lives of early Christian believers and worshiping communities? The New Testament makes several points clear.